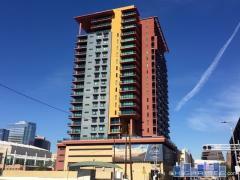 CONTOUR on Campbell is a new luxury condo building located in Phoenix's uptown urban core. The central location is near downtown, using districts, the Biltmore, restaurants, and entertainment. CONTOUR on Campbell is scheduled for completion in Fall 2017. Have any comments or questions about CONTOUR on Campbell Condos? Ask your question and/or share your thoughts about this Building.